Virtually every player 25 or younger that saw meaningful playing time improved as the season progressed. Rookie, veteran, it didn’t matter: progress was near-universal. We should expect some players to progress, but this many is uncommon. Brandon Boykin showed a lot of potential last year, raising his expectations. He surpassed them, becoming one of the best slot corners in the league, which is no longer a niche role as 3 WR sets are becoming more and more common. Bryce Brown still frustrates us by cutting nearly everything outside, but he improved his biggest weakness: he never fumbled the ball. Fletcher Cox looked like a good 4-3 tackle last year, one of the few bright spots on a disaster of a season, particularly on defense. It took him about a month to fully adjust to playing 3-4 end, and he played great. Vinny Curry was lost in the mire that was the 2012 Eagles defense, like Brandon Graham a victim of his position coach not being on the same page as the rest of the team. The switch to 3-4 end put his future in doubt to the point that there were trade rumors about him in camp and he started the season inactive. He responded superbly, becoming a solid situational player, finishing third on the team in hurries and sacks, which is a pretty good gig. Zach Ertz admittedly played so poorly in pre-season that he forced the coaching staff to not play him early in the year. But then he obviously changed their minds and in the second half of the season came on so strong that he finished with one of the better rookie TE seasons in recent years. The Eagles passing offense exploded in the second half of the season and obviously Nick Foles was a huge reason for it. But the emergence of Ertz was also a key factor. Nick Foles well, what is there to say that has not already been said? He was clearly not the best QB on the team in pre-season. He finished as an MVP candidate. Says it all. Lane Johnson struggled early in the season, but got better as the season went on. For a rookie offensive lineman, particularly one who has only played the position for a couple of years, not sticking out for sucking is a pretty good season. Mychal Kendricks had an up and down season for about two and half, three months, then had the best month of his career in December when the team needed it the most. Bennie Logan made the guy who was ahead of him on the depth chart at the beginning of the season expendable. Granted, the play of Isaac Sopoaga also made Isaac Sopoaga expendable, but the coaching staff clearly felt so confident in Logan that they were willing to get rid of the guy he was splitting time with. LeSean McCoy is a champion. Chris Polk is tough to judge because he never played last year, but he looked good in the 2012 pre-season, looked good in the 2013 pre-season and looked good in the 2013 season. Cedric Thornton went from barely playing last year (and not playing at all in 2011) to one of the best 3-4 DEs in the league in 2013. He might be the best player on the defense. 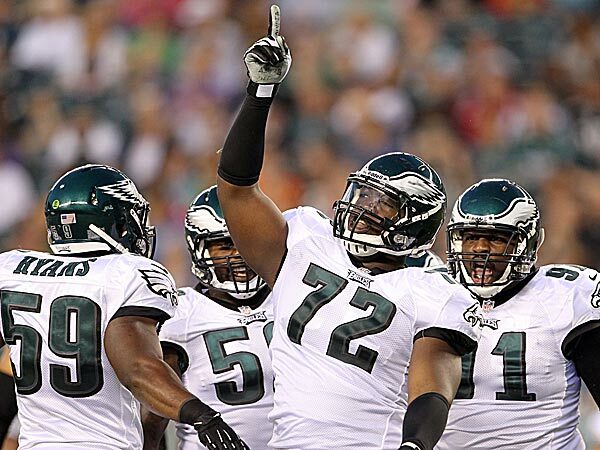 Earl Wolff had weak competition ahead of him on the depth chart but so have many other players who failed to impress. The Eagles will add someone at safety, whether it be a free agent or a draft pick, and Wolff likely will enter training camp deservedly at least penciled in as a starter. Not bad for a 5th round rookie. The only player to get any real playing time that did not clearly improve was Brandon Graham, but it is not his fault he was miscast into a 3-4. He did not regress either, he just is not a good fit for the defense. He might not be on the Eagles next year anyway. Except for McCoy none of these players were established players coming into the season, and the transition from the 4-3 to the 3-4 put question marks on everyone on the front seven. A year later, they are all firmly part of the core of the 2014 Eagles. Everyone else is better than than they were at the start of the season, which is not an automatic thing. That is a huge, huge testament to the coaching staff, and the players as well. Some of these players still have room to grow, but they all have roster spots locked up for 2014, many of them starting spots. The future of the Eagles looks bright not just because Chip Kelly is at the helm, but also because of the development of his crew. Sometimes youth is not wasted on the young.